MONTPELIER, Vt. – One of the great wildlife migrations is happening right now in Vermont, and it’s taking place right at our feet. 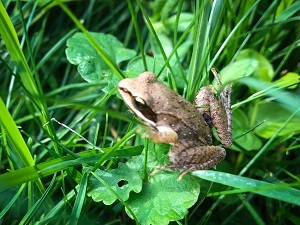 You may have already heard the spring peepers or wood frogs calling in your backyard. Amphibians are on the move, but their spring breeding migration can too often become deadly. Amphibians migrate by the thousands each spring in search of breeding pools. This migration frequently takes them across roads and highways where they are killed by cars, which contributes to the species’ decline in Vermont, according to biologist Jens Hilke with the Vermont Fish & Wildlife Department. Hilke is asking drivers to report these hotspots, or areas with large numbers of frogs and salamanders that cross the road all at once. They can either report them through the Vermont Reptile & Amphibian Atlas website at VtHerpAtlas.org or by emailing Jim Andrews at jandrews@vtherpatlas.org. “We work hard to identify these hotspots and to mitigate the problem whenever possible to help give these animals a better chance of survival,” said Hilke. The Fish & Wildlife Department is working with the Vermont Agency of Transportation and other conservation partners to include culverts and wildlife barriers in road construction plans that allow wildlife, from frogs to moose, to more safely cross the road. Conservation officials and volunteers also work together on rainy spring nights to slow traffic and manually move amphibians across the road.